The knowledge of culture of a society can be known from the festival they perform. We can learn about their philosophy, their talent in fine arts and creativity and their social structure by study of their festivals, their development and significance. Bishnupriya Manipuris performs all the important festivals connected to the cult of Gaudiya Vaishnavism, but there are some colorful and notable festivals which are particular to Bishnupriya Manipuris only. The most important of all the festivals is Bishu. Bishu is identical with the Cheiraoba festival of Manipuri Meiteis, which is celebrated in the first day of Manipuri month Sajibu (March/April) in order to herald a ‘New Year’. Every house including the royal family in Manipur take part in this festival with great enthusiasm. 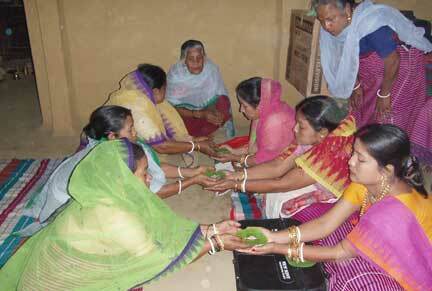 The Bishu festival is traditionally observed from the last day of the year and continues for seven days. On the first day of the festival, special worship of family ancestors with offering of specially cooked food items (mainly different kinds of dhal and vegetables) are carried out in every Bishnupriya Manipuri family irrespective of their Sageis or Lokeis. The offerings are decorated in a banana leaf and placed at front of the main gate (Aarang) of the house. After the offering the different kinds of cooked dishes are exchanged amongst the families of neighborhood and relatives. At the evening the women folks get busy with making different kind of Pitha’s with paste of rice or wheat and distribute them among the guests. From the evening of the day up to the seventh day, competition different kind of traditional games are held between different parties. 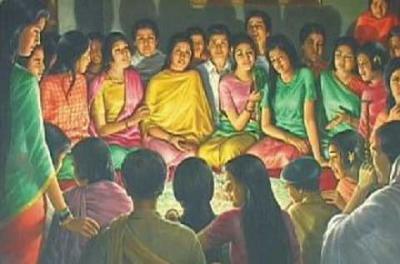 The principal game played during Bishu is ‘Nokon’ – a special kind of game. Another traditional game played during Bishu is ‘Gilla’, which is played with a flat and round piece of horn or wood. The players are mainly groups of young boys and girls. 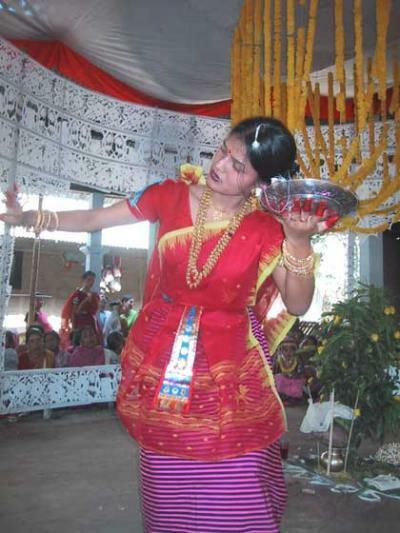 The festival of Bishu is a traditional festival based on traditional customs, rituals and philosophy. It is a living testimony of a well-organized civilization that our forefathers established centuries ago.